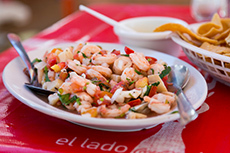 For such a small island Isla Mujeres is a foodie’s paradise! There is something for everyone - American, Mediterranean, Italian, French, Asian and of course Mexican and the freshest seafood you can get. 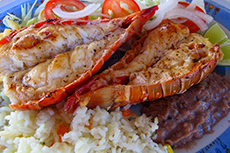 Dishes like ceviche, grilled shrimp and lobster and an ancient Mayan dish called Tik’n Xic - a whole fish marinated in achiote, a mild chilli red sauce, and then grilled over an open fire. Visitors have said that they come back to Isla every year not just for the beautiful beaches and friendly people but for the food! A word about restaurant review sites. Some visitors to Isla Mujeres make a list of the restaurants they want to eat at based on review sites. Those sites can be helpful but don’t decide where you go solely on the highest reviewed or you might miss out on that special place you’ll fall in love with. The best plan is to stroll the streets and follow your nose! Be sure to explore the side streets, many excellent restaurants are not on the main avenue and don’t limit yourself to eating only in town, some wonderful restaurants can be found scattered around the island. The Bill. All restaurants on Isla Mujeres accept USD. Exchange rates fluctuate daily and the restaurants will not give you the same rate as the bank. Usually it will be a peso or two below, not much difference when the bill is only a couple hundred pesos but adds up when you get into thousands of pesos. If you do pay in USD - don’t think of the gain as a tip for the waiter, any advantage (or disadvantage) goes to the restaurant not the staff. Some restaurants and bars automatically include the tip (“propina") on the bill, most often with large groups. Always check the bill to see if service is included or if there are errors. There should be no tax (IVA) added to restaurant bills. Mexican Consumer Law requires tax to be included in the menu prices. If you receive a bill with both “IVA” and “propina” added you are being taken for a ride. This very rarely happens but its best to keep an eye out. Tipping. It is customary to leave a tip equal to 15 to 20% of the total bill. If a service charge is included, you may choose to tip extra for great service. Remember, foreign coins are worthless in Mexico, tip only with bills or mexican coins. Lunch & Dinner - Take out/delivery, small setting area. 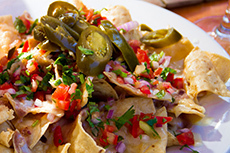 Isla Delivery Isla restaurants & more right to your door! La Justicia de Don Pino The Freshest Seafood! Visit these Isla Mujeres food blogs: Holly Eats and Food Musings.